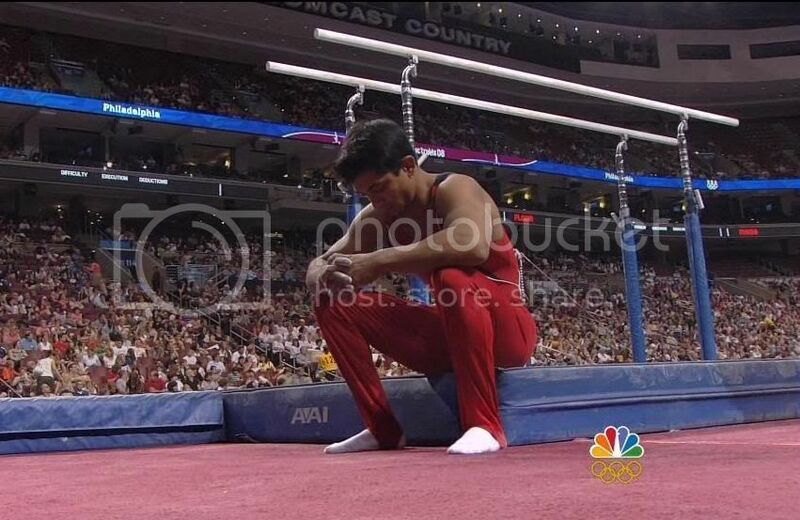 The final day of the Mens Olympic gymnastic trials in Philadelphia were shown on NBC on June 21. The coverage was focused on Raj Bhavsar and his pursuit of a guaranteed position on the team. As anyone who follows mens gymnastics knows, the prejudice of the USA Gymnastics organization against Indian-Americans and the favoritism shown to a favored few, has and would probably again keep Raj off of the team unless he clinched an automatic position under the rules. The commentators seemed to understand that and kept the story of the event being about Raj and how he could beat the selection committee from keeping him from going to Beijing. The NBC team consisted of the usual Elfi Schlegel, Al Trautwig and Tim Daggett. There was also a short incomprehensible "comment" from Bela Karolyi, which sounded identical to a curse from a confused street person. Tim again provided the most color in the commentary by making everything sound like a review of a gay adult video. Tim speaking about Sasha Artemev: "H's so dynamic, so big..", "It's just a trill ride of a routine. ", "He'll put his hand out backward and do a full spin. ", "This is where it gets really nasty..."
The commentary from Elfi wasn't as informative. About Sasha, she said that he's so frustrated because he doesn't know what he is doing wrong on the pommel horse. Well, the answer is he keeps falling off of it. It didn't take any journalistic credentials to see that. When Raj finished his rotations it was noted that he had barely missed meeting the threshold to get the automatic placement. He needed to be in the top two overall and in he top three in three individual events. Al asked Tim if there was any sentimentality about Raj being in the same place twice so that he could get the spot he had earned. Al should have asked, is there enough integrity in the selection process to allow Raj to be selected. Tim's answer would have fit either question: "There is not." At the end of the event it was announced that Jonathan Horton and Paul Hamm had been selected for the team. So far, that's understandable as Hamm and Horton would be in anyone's list of the top 6 Americans. Horton placed highest among U.S. men at the last world championship. Hamm had injured his hand so he had to petition for inclusion instead of earning it at the trials, but his mastery of the sport is unchallenged. It was stated that within a day the remainder of the team would be selected after all the various factors were considered that would give the resulting team the best results. If past experience is a worthy guide, it is extremely likely that that principle would quickly be thrown out and any sense of objectivity would be ignored and the final selection made by a combination of favoritism and prejudice. That's the way USA Gymnastics likes it instead of just leaving it up to the athletes to earn the top six scores at the trials. BTW, I was sad there was no air time given to Guillermo Alvarez. He's still one of my favorites. The nuttiest comment from NBC's coverage: Al Trautwig said about Kevin Tan, "I think it's unbelievable that the United States could have a man of Chinese descent with them when they travel to Beijing." Gratuitous image of Joe Hagerty in a suggestive pose. 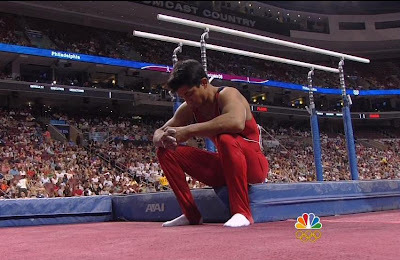 June 22 Update: Not surprisingly, Raj Bhavsar was screwed once again out of his proper place on the U.S. Olympic team. The calculations used for selecting the team added in the value of each of the athlete's skills on the apparatuses and then gave a huge deduction to anyone that was a Desi. It disgusts me that a sports governing body in the United States would be so flagrantly prejudiced against ethnic groups that don't fit don't fit into their stereotypes that the best gymnasts are only of European and East Asian ethnicity. 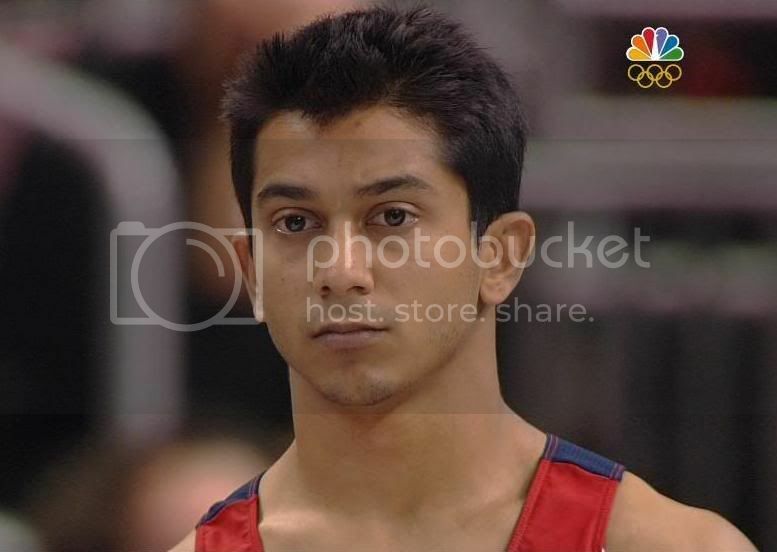 Raj was selected as an alternate and it will be interesting to see if injury causes a team member to drop and whether or not USA Gymnastics will be so bold as to try to block a great American like Raj Bhavsar one more time because he doesn't look like they do. The team will be the shirtless Paul Hamm, Morgan Hamm, Jonathan Horton, Justin Spring, Kevin Tan, and Joe Hagerty. Alternates are Raj, Alexander Artemev and David Durante.